Description: 123 DVD Converter is a powerful and easy-to-use Windows application that lets you convert your DVD movies to high quality AVI (DivX, XviD...), WMV (Pocket PC, Zune), iPod, PSP, MP4, 3GP, MPEG and VCD formats. It also extracts audio tracks from DVDs. 123 DVD Converter is able to copy protected DVD movies. Guide: http://www.dvdvideotool.com/dvd-to-xvid.htm For more information, please visit http://www.dvdvideotool.com/dvdconverter.htm . 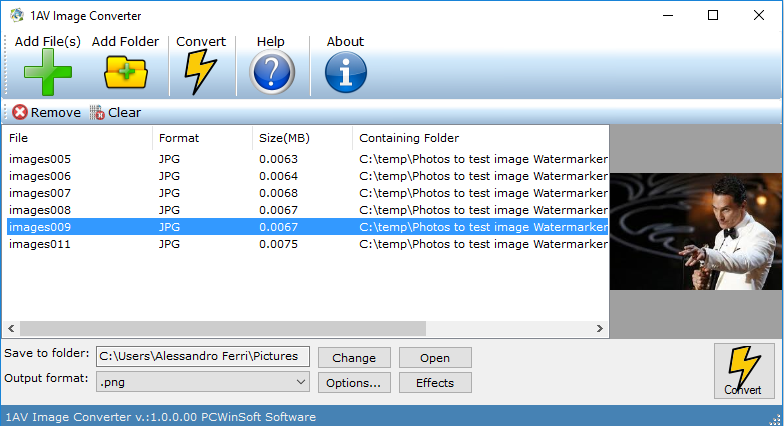 Description: 1AV Image Converter is a image file converter that converts image files to a wide range of image file formats. Input formats are: JPG, PNG, GIF, BMP, TIF, TIFF, and ICO. Output formats are: PDF, PSD, BMP, DPX, GIF, ICO, JPG, J2C, J2K, JP2, PAM, PBM, PCX, PGM, PNG, PPM, RAS, RGB, SGI, TGA, TIF, TIFF, WEBP, XBM and YUV. The program is very easy to use. There is practically no learning curve. Description: 1AV MP3 Converter is an all-to-all sound file converter that converts MP3 sound files and other format sound files to any sound file format. Formats supported are aac, ac3, aifc, aiff, aif, amr, au, caf, cda, flac, m4a, m4r, mp3, ogg, opus, raw, spx, wav and wma. The program lets the user convert mp3 to m4a, wma to mp3, mp3 to aiff, wav to flac, m4r to ogg, mp3 to wma, and all other possible combinations. Description: 1AV SWF Video Converter converts Adobe Flash SWF movies into videos targeted to all types of devices including PCs, tablets, mobiles, and game consoles. You can convert SWF to AVI, SWF to WMV, SWF to MP4, SWF to FLV, SWF to 3GP, and much more... The program is very easy to use, very intuitive, there is practically no learning curve, it is well structured making it easy and fast to comprehend how to use. Description: 1AV Video Converter converts videos to a large number of formats providing the ability to change key parameters like video output resolution, aspect ratio, PAL or NTSC, video and audio codecs, audio bit-rate, video frame-rate, audio sample-rate and audio volume dB normalization. With 1AV Video Converter you can convert video for any kind of device. Description: Video Converter is an easy-to-use tool to fast convert between various video/audio files. It is an application that enables you to turn audio and video files into AVI, MP4, WMV, MKV, MOV, MPG, RM, RMVB, 3GP, VCD, DVD, DV, Flash Video FLV, SWF, HD MP4, H.264, XviD/Divx, etc. and audio MP3, MP2, WMA, OGG, AAC, AC3, FLAC, WAV, RA.